London Skyline seen from Greenwich Park. Overlooking Canary Wharf with Maritime Museum. 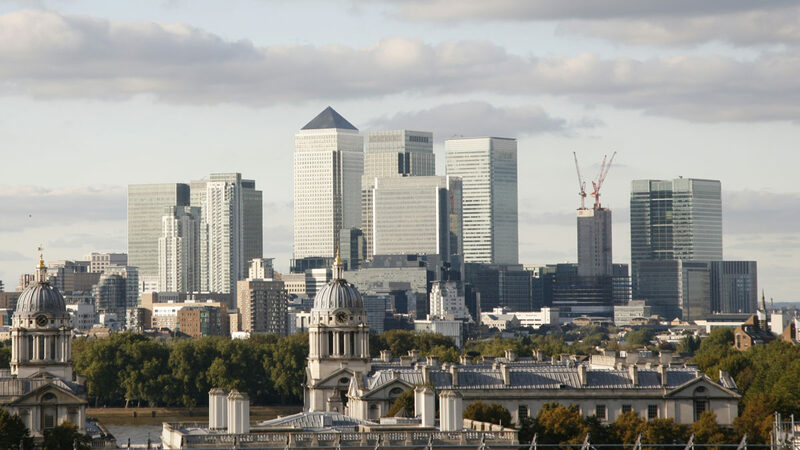 Greenwich sits opposite Canary Wharf, one of the wealthiest parts of Britain. Like many parts of London, it doesn’t struggle to attract inward investment. However, for its council, the community wealth building model–more typically adopted by former industrial cities like Preston and Cleveland–has much to teach this London Borough too. The success of the community wealth building model is well documented in Preston, where a whole-system approach to empowering the local economy has seen an estimated £700m of spending redirected towards locally-owned businesses. It’s an approach that seems to be bearing fruit, with the City recently awarded the title of ‘most improved’ in the 2018 Good Growth for Cities Index. But can the ideas and principles of Community Wealth apply as much to a London borough as a northern city? Greenwich says yes. While borough’s economy may be doing well, the rest of the Capital is awash with examples of what happens when large-scale inward investment and redevelopment fail to keep pace with the needs and aspirations of the people already living there. Set in these terms, a local economic model that empowers, rather than sidelines, local people is needed here as much as anywhere. Greenwich is charting out its course to build community wealth for all residents. A borough which boasts the highest number of Co-operative councillors in the country, it’s Leader Danny Thorpe (@DanLThorpe) has been setting out a vision of local economic development which seeks to empower residents amid the uncertainty of post-Brexit Britain. Two years of uncertainty surrounding Britain’s departure from the EU (the Borough voted 55% to remain) is permeating all aspects of life, manifesting itself in increased business and employment uncertainty. The council faces the prospect of losing its EU grant funding, having already weathered a decade of austerity through cuts to its Central Government grant. All this is set against the backdrop of an increasingly divided society, with rising mistrust in the ‘system’. Having agreed this strategy, the Council is wasting no time in working to deliver it. They are currently reviewing the £350m the council spends a year on goods, works and services, much of this with local suppliers already, as well as their social value policy. They are consciously keeping the workforce in-house, and have the seventh largest non-school workforce amongst London Boroughs. The borough is also already home to a staff-led co-operative, Greenwich Leisure, which runs many gyms and leisure centres across London and beyond under the ‘Better’ brand. This is also a workforce that benefits from the London Living Wage and encourages local businesses to do the same. The council also looks to help local people get into the jobs available in the Borough. The Greenwich Local Labour Programme is designed to support individuals who have been long-term unemployed, matching them with a 6-month-long placement in a job in the Borough that pays the London living wage. The scheme also provides intensive 1-1 support and childcare arrangements to help support the individual into work. The scheme has been operation since 2013 and has led to hundreds of residents securing onward employment. A key element of implementing the co-operative vision for Greenwich is empowering residents and involving residents in local investment decisions. That is why the council has introduced the Neighbourhood Growth Fund, which supports local projects. The scheme also includes a locally-controlled budget of £30,000 for each of the council’s wards, putting the money- and decision-making back to the most local of settings. Read our guide : Six steps to build community wealth.